The greatest challenge for all of us in HR is that we’ve designed tools that seem disconnected from the real world. Competencies is a great example. We define leadership with so many qualities that an individual person is supposed to have, when that person clearly does not exist. Which means that almost immediately, every competency model reveals that HR is out of step with the real world. The once-a-year goal alignment tool is another great example: Everyone in the real world knows that the goals you choose at the beginning of the year are irrelevant by the second week. Goals shift so fast in response to real conditions that any goals aligned to strategic priorities are simply an illusion to make somebody at the top of the company feel as though they have a mechanism to control work in the real world. To the people in the trenches, pretending that goals are static makes them think we’re asking them to join a fantasy world. Static teams are equally unhelpful: work gets done by agile, dynamic teams that are constantly changing, so looking at engagement feedback for the static teams arbitrarily listed on org charts is irrelevant. It’s from a parallel universe that doesn’t match the reality of teaming going on in the organization. 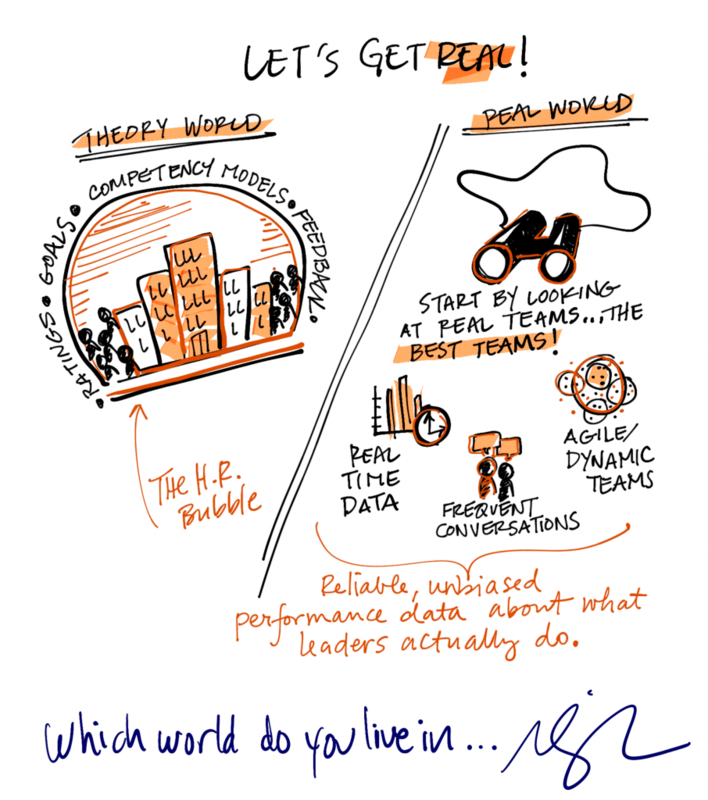 We in HR have designed systems for a parallel universe, a world that’s irrelevant to the real challenges that a team leader and a team member face. The biggest challenge for all of us in HR is to get real. Look at the dynamic teams to see where the work happens. #LOVEandWORK Click To Tweet Have the team leaders talk to their team members about near-term future work. We can only build highly productive organizations if we build tools and training for real people on real teams doing real work in real time. Great video! I wanted to stand up and clap as I watched the video. I expected Marcus to literally drop the mic as he finished. I’ve been in HR for 30 years and have spent the last 10 years trying to undo all the crazy stuff I helped build during my first 20 years. Somewhere I have a competency model on the competencies someone should have to develop competency models!! Hi there Bruce. Thanks for watching. Cheers to the last 10 years of ‘undoing’. Keep up the great work. Such an important point about leadership competencies! Thanks Aman. Hope you come back for more. Fresh and inspiring words, fantasy World! I am a big fan of your thinking and think you are a genius about performance management. I worked HR in the military for 15 years; and taught leadership for ten. Leadership is about influencing people and everyone is a leader. When I transferred to a civilian HR position I was disappointed because of the lack of leadership. Everyone was a manager. That was the excuse for not taking inherent responsibility (and words have meaning). As the HR representative trying to implement leadership to move the company in the right direction, I was stymied. “Top management” only saw the changes as an expenditure….I resigned from the company..
You have made a very good video – I like it, and the whole notion of realising and recognizing how performance actually occurs, is very timely now with knowledge workers pouring into organisations. In essence the jobs way back was mostly brawn, physical power bought by landlors or factory owners to do the harvest or plow, to tend machinery etc. Then work became brain, skill sets in departmental tribes, oftentimes being at war with each other. But now its not brawn, not brains, but hearts (or Love as you put it). And you cannot buy or pay hearts – you have to win them! That’s a whole new challenge for leaders. Hi Marcus, I work for a govt organization that lives in the fantasy world. I also a tax paying citizen of that organization. I agree with you 100%. The way the are running the org is killing everyone, destroying the productivity. I would like to bring you over and teach them how to change it to produce more with less, also appreciate and support employees, allow the leaders to support a team that works rather than break the team that works with their insecurities. Can you please email me. I would like to speak to you, how you can help my govt. Thank you very much for your help. I can raise the funds. Please visit https://www.marcusbuckingham.com/index.php/keynotes/ to request Marcus at one of your events! This is so good. I have been away from Marcus Buckingham and the great work he continues to do for too long as I redirected my career from leading/managing people and work to implementing better systems for leading/managing people and work. I forgot how inspiring truth can be. This new focus is very appropriate to what I am doing now. Thanks Marcus. Thank you, Dave! Yes, it’s amazing how much something as simple as “truth” can impact our lives. Thank you for coming back to the Strengths Movement, I’m excited to hear what systems for leading/managing people you use. How do I get to part 6? Hi Patrick – Part 6 is still in progress, but we will share it as soon as it’s ready! Great insight; your comments on static teams and goals were extremely accurate. #COYG! The systems have been designed to mitigate legal risk over the last 25 years. The risk is real. However, the irony is that managing risk rather than managing people actually increases risk because it ignores the reality that people are having to live in. Those parallel worlds are what produce so much stress in the lives of individuals trying to get work done. It is also the reason in many organizations HR is viewed so negatively. Well said. All I can say to that is amen! Marcus, you are so on the nail. Trying to unpick this against the background of the dogma and vested interest is the fun bit!